Moderately fine-grained, brecciated marble, reddish purple ground with large white inclusions (plagioclase feldspar). Probably breccia corallina (from Bithynian quarries). 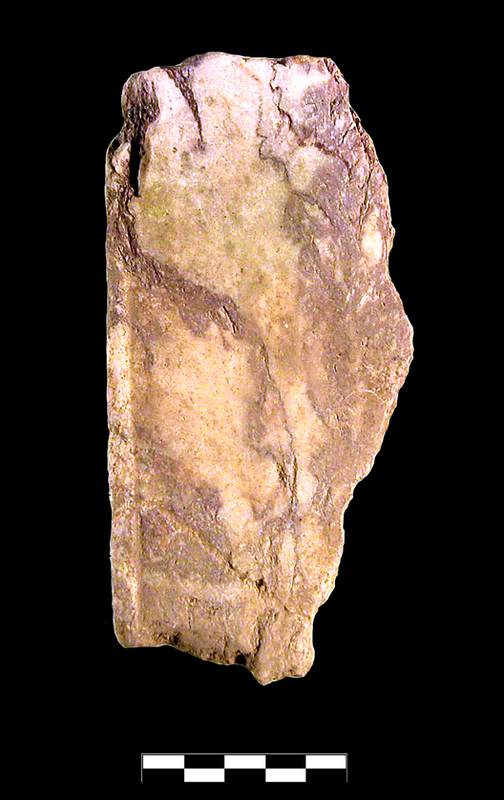 Substantial rectangular fragment from the edge of a plaque of marble revetment. Flat plaque that is polished on the face and slightly rougher on the back. One preserved edge has a thin, raised lip for delimitation (0.037 m Th, 0.004 m W). One large fragment broken on three sides. Sparse, slight scoring and chipping; slight, sparse encrustation.